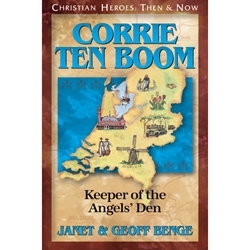 The harsh lights stung Corrie's blackened eyes as she entered the Gestapo-controlled police station in Haarlem. How true her elderly father's words had been that quiet evening before Hitler's madness descended on Holland: "Germany will invade Holland. We will lose. God help all those in Holland who do not call on His name." Suddenly, Corrie's ordered life was lost in the insanity of war. With bravery and compassion, her family and countless other Dutch citizens risked everything to extend God's hand to those innocents marked for certain execution in a world gone mad. Corrie ten Boom's life of determination, faith, and forgiveness in the face of unimaginable brutality and hardship is a stunning testimony of the sustaining power of God (1892-1983).